NEWPORT, Ky. -- "The thing about Newport is, people don't know that behind the houses are all these secret gardens," Emery Schmidt said. He was speaking from his own such garden, behind the 1894 Queen Anne Victorian he shares with his husband, Jim Swearingen, in Newport's East Row Historic District. It's true: You wouldn't guess the small lot behind the home on a quiet, tree-lined street holds a two-"room" garden in which seemingly every inch of available space is used. You can visit the garden, along with seven others, during the East Row Garden Club's 22nd annual Newport, Kentucky Garden Walk June 2-3. Schmidt's home has made repeat appearances on the Garden Walk and other tours. He bought it in 1991, not long after his career with Delta brought him to Cincinnati. "Parts of this neighborhood were pretty questionable when I bought it," the North Dakota native said. "Everyone at work said, 'Tell me you didn't buy in Newport.'" The house, although it needed some work, was appealing for its original features, including the large front door with its twist doorbell, pocket doors, unpainted woodwork and hand-carved fireplaces with metal summer covers and distinct tiles. (The one in the guest suite, for example, features hunting dogs, while the one in the master bedroom boasts a fleur-de-lis motif.) Intricate lattice fretwork would once have held heavy drapes to close off the front parlor, letting the residents heat only rooms that were in use. Fortunately for Schmidt, the home's previous owner had converted it back to a single-family home from its brief incarnation as three apartments. Schmidt made additional improvements by adding air conditioning and a first-floor half bathroom as well as removing carpet covering original hardwood. The neighborhood has improved during his time there, too. Schmidt, now retired, credits the various tours with bringing more people to the neighborhood and aiding in its revival. Swearingen, who is originally from Cleveland but has lived in Cincinnati since attending college, moved into the Newport home and neighborhood in 1998. He and Schmidt, who met on a blind date, have been together for 26 years and were married in 2013. Swearingen brought with him his love of collections, adding pieces such as cloth clowns and whimsical shadowboxes alongside the antiques and travel mementos the couple has used to create the home's decor. "I just gravitate toward sculptures and things that are three-dimensional," Swearingen said. That might be an occupational hazard. Before he retired, Swearingen worked as a toy designer. He was one of the first to design Kenner's wildly popular "Star Wars" toys. His figures grace shadowboxes on the dining room fireplace mantle, near family heirlooms such as a clock that belonged to Schmidt's grandfather and a landscape painting by Swearingen's great-grandmother. Swearingen pushed to make the toys. It may seem hard to believe now, but back then, there were questions about whether or not "Star Wars" would be successful. "Because it was a movie and science fiction, they thought it would be in and out of the theater in two weeks," he said. Over the years, the toys took on a life of their own. Swearingen talks about them in the first episode of the Netflix documentary "The Toys That Made Us," released in December. He has planned appearances at five different Comic Cons this year. Swearingen isn't the home's only documentary star. A 2005 DIY Network show called "Garden Sense" showcased its front yard, and the back gardens were recently featured on KET's "Kentucky's Secret Gardens." The home's outdoor spaces and the work Schmidt and Swearingen have done to create them certainly deserve the limelight. In the front, they added terraced stone walls overflowing with perennials to replace a grass-covered slope. Along the side of the house, before the gate into the back gardens, there are perennials with stories: A peach-colored "Polka" rose was a gift to Schmidt when his mother died in 1999; he got the blue hydrangea when his father died three years ago. There's also 40-year-old sedum that once grew at the house across the street and bushes that Schmidt planted some 20 years ago. The back garden is the real show-stopper. It's designed to have two "rooms" divided by a little brick wall: One for gardening and one for entertaining. Schmidt and Swearingen add to the mostly perennial garden each year; this year's addition is an arbor that will soon have green beans growing up it if all goes well. Through that arbor are lots of what Schmidt calls "old-fashioned" flowers, such as zinnias and salvias, along with multiple varieties of hostas. On the side of the one-car garage, which they think dates to the 1910s or 1920s, is a fountain and one of several lattice windows with mirrors added to make the gardens look larger. From their kitchen window, they can look out and see the entire garden reflected back to them. Sensitive plants, including the begonias and the succulents of which Swearingen is fond, spend winters indoors, and the couple brings them back out each spring. In front of the arbor are seating areas for dining, entertaining friends or just taking in the garden. 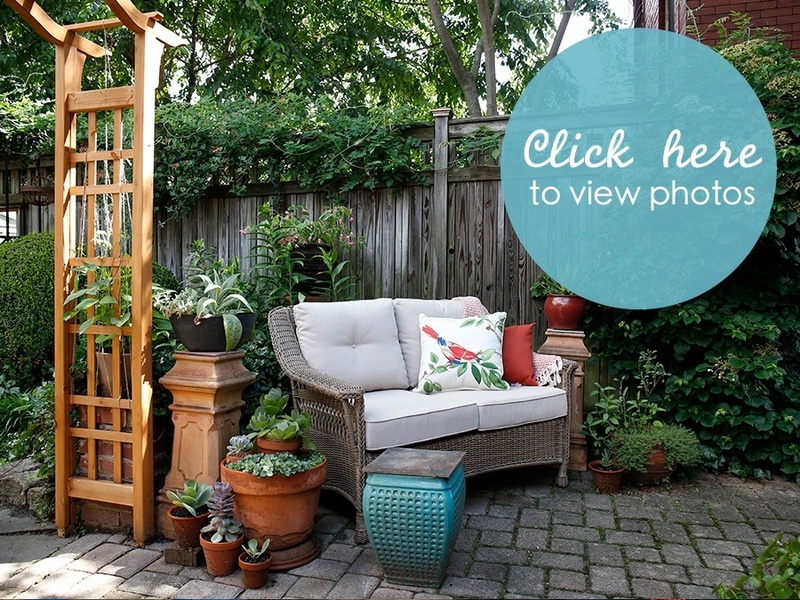 Want to create your own secret garden? Schmidt advises noting details such as how sunlight moves through your yard and then drawing out a plan. You don't have to be too serious. "Have fun," he said. "A lot of things happen by accident." Where: Eight private gardens and a "relaxation station" garden. Parking and ticket sales/will-call at Watertower Square, Sixth Street and Washington Avenue, Newport. Tickets: $15; children under 12 are free. Tickets are for both days, allowing admission to each garden once. Available with cash or check day of tour or online .